Comforter is as described. Has had minimal shedding of down feathers. It would be better if the corners of the comforter had ties so that we could attach it to our duvet, but we have made due without this feature. We live in a hot climate, and this comes in handy in the "winter" months, however, in the summer months, we don't need it and we usually fold the duvet up to the foot of the bed at night due to this. It gives the duvet a pretty cozy shape. We have had this comforter for quite a while and it is holding up extremely well. Stay warm and cozy all year round with this classic white down comforter. The soft 233 thread count pure cotton cover is filled with premium hypoallergenic down. 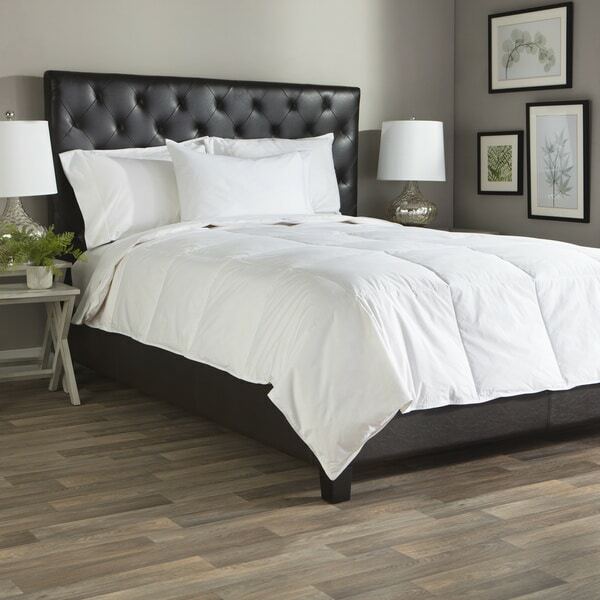 This lofty comforter features a sewn through box quilting to maintain an even down fill distribution and keep you warm and provide a consistently fluffy appearance and feel. I love this comforter. It was delivered quite fast. On arrival, the comforter is completely flat. One has to shake it up and after several hours, it is fluffy. It becomes more so after a few days. The quality is very good, also compared with a quality comforter that I purchased from another company. The warmth level is year round. It is comfortable at bedroom temperatures between 64 oF and 76 oF. I would bye this comforter again. I wanted a down comforter that was 100% cotton cover and 100% down filling that was also lightweight and able to use in all weather conditions. This one is perfect. As expected, it does smell a bit when opening and requires a bit of airing out. It does state dry clean only but I washed it and it stood up just fine and fluffed to a wonderfully cozy cloud of a comforter. The smell was gone after the washing. Very happy with this product, cant believe I could still get an actual Down comforter for this price. Keeps me nice and warm and my wife loves it too. Highly recommend. I was looking for an all-season down comforter that is machine washable as this product advertises yet when I received this particular item the care instructions say to "professionally clean or dry clean." I find this misleading. I would keep it but it does smell like it has been chemically treated and because I can't throw it in the wash I will most likely return it. Otherwise it would be fine~ just be aware it needs to be dry cleaned. I needed a super lightweight down comforter for my duvet in the Arizona summer. This was perfect. My duvet is white, so needed one that was also white. I like to covered even in the summer, this is light and breathable. Just what I was looking format a great price. Wanted a 100% cotton shell as well. It's very light and thin, but it is warm and comfortable for fall weather (about 50F). It's not an all season comforter. It could be too warm if temperature is above 65F. I read the other reviews and they were right on target. The comforter comes out of the bag looking very flat but after a short time in a hot dryer, it was nice and fluffy. This is definitely a lightweight comforter, so if you are looking for something heavy, this is not what you want. But if you want a summer weight comforter, I strongly recommend buying this one. The price is great and so is the quality. There is nothing to dislike about this comforter. I used it all winter in Colorado and was pleased with how cozy I was, and yet, the crisp Cotten material and lightweight nature of the comforter will be great during summer nights, when I open my windows to sleep and it gets chilly in the wee hours. I am pleased with this comforter, and have no complaints. Short on length and width right out of the packaging, loft was fine. I was forced to launder this comforter--cold water, low heat drying and it is now literally twelve inches smaller in size--so disappointed. It works well, but it's skimpy on length and width. Love the comforter. Thought I had ordered a light weight one. For this time of the year, it can be too heavy and hot. A perfect weight for an additional blanket on the bed. Vermont gets chilly and this adds warmth to our bed. It is useful year round, a sheet and this works on cool summer nights. Very versatile. I love this comforter. Really keeps you warm on those cold nights. It fluffs up very quickly after taking it out of the packaging. I have a thin quilt comforter that lays on top of it. Love the way it looks! Excellent quality...medium weight. Recommend this item! This is a great, functional comforter, and it's stood up to a lot of use. My kids drag their comforters all over the place to make "nests" and this one is still in great shape. Lightweight and fluffy but still keeps me warm during colder nights. Spouse works nights and is comfortable during warmer day temperatures too. Win, win. Definitely recommend. Noisy and not very soft. We did not end up using it much. great style. not too hot in the summer, but toasty warm in the winter. lightweight so you don't feel smothered. This is the perfect weight duvet insert for Florida! My husband and I could not be any happier. It is not too hot, very light and airy. For the price, we couldn't have expected a better quality. "Is this really warm. I live in the northeast and it gets very cold..i realy need for the cold winter"
"Does this comforter have loop holes for duvet ties?" Hello tk2242, no, this does not have loop holes for duvet ties. Thanks for shopping with us! "is this made in the U.S.?" Hello risacheer, the country of origin is China. Please let us know if you have additional questions. Thanks for shopping with us. "25% feathers. Are they the very small down feathers or the larger ones that poke through"
Hello stasiaanne, we do not have this information unless we take a pillow apart. We have not had any reviews mentioning feathers poking out. The overall approval rating is 4.6 which indicates a high degree of satisfaction. Thank you for shopping with us. "Has this comforter been chemically treated, as one reviewer suggests?" Hello nmkat, thank you for your inquiry. We are not aware of of this item being chemically treated. Thank you for shopping with us. "Anyone have any issues with these leaking? I am looking for a leak proof comforter and I am not sure this is a high enough thread count to prevent leaking. Thanks for your time." Hello ultra353, so far we have not had any reviews stating that this comforter sheds. We welcome additional information from reviewers. Thank you for shopping with us.